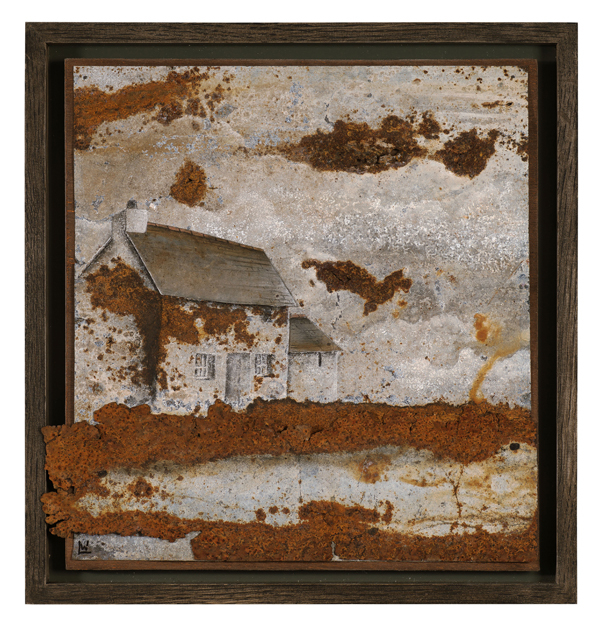 Lisa Wisdom creates her unique metal landscapes from a palette of Rust and Copper found on forays into the remoter parts of Cornwall. The distinctive scenes of wild moorland stretching down to the copper blue sea, evoke memories of coastal walks. Although Lisa recreates her sketches as images in metal, frequently a landscape appears to her in the metal, as she finds it. Often starting as a patch of sky with a horizon line distinctly ‘in’ the found corrugated roofing sheet, she works on several images at any one time. 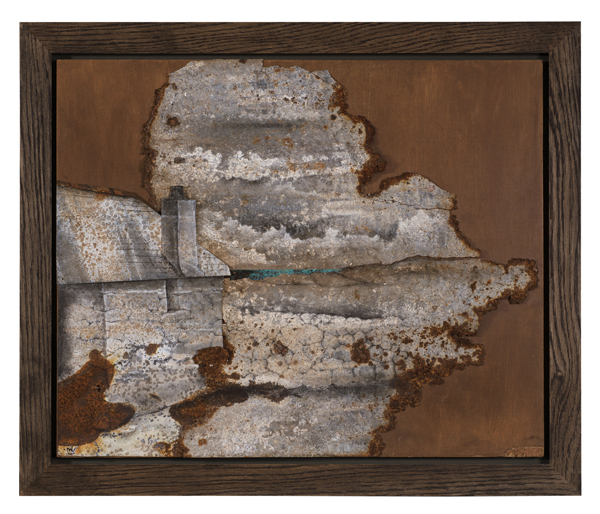 The landscapes appear, layer by layer, using the colours and shapes that are naturally occurring within the state of rust and decaying metal. Lisa will use black and white charcoal pencils to define line, or create tonal variations to increase the perspective, but use of these is minimal. Rather, she will carefully select pieces of metal that speak to her of sky, wall, or vernacular building, that have light and tone in place naturally. Using steel pins and hammer and anvil Lisa then attaches the layers to the board. Daughter of Potter Nic Harrison and Weaver Jackie Harrison, Lisa grew up immersed in the thriving Art and Crafts community of Cornwall. Much of her childhood was spent at Trelowarren, where she spent many hours at the feet of prominent makers of the time, Basket Weaving with Graham Brown, making Jewellery with Janet Slack and exploring Textiles with Vivian Prideaux. She wrote Poetry with Bob Devereaux and attended Painting Classes with Anthony Frost. Lisa self directed her further education, attending St Ives school of Art and Penzance Art School for the study of Life-Drawing, Photography and Jewellery Making. She completed work experience placements with Potter Debbie Prosser, and the Norfolk based Jeweller Alison Varley. She also worked at a placement in an historical Silver Mine in the French Alps in order to better understand the origins and journey of metal, from ore to work bench. It was during her training as a Jeweller at Birmingham School of Jewellery that Lisa was first introduced to the art of Blacksmithing whilst having to make jewellery tools in the Schools Forge. She went on to study at Hereford School of Blacksmithing, continuing to hone her new found skills by working for Blacksmiths around the UK, France, North America and Canada. On returning to her native Cornwall in 2008, she set up Smythick Forge near Falmouth and started producing a wide range of hand forged interior and exterior ironwork both functional and architectural. Commissions at this time included an Arts Council funded 40ft long sculptural steel wall in Redruth. Also a large interior screen, incorporating double gates, for St Euny Church at Carn Brea. Funded by the Landmark Trust she restored the Smithy on Lundy Island in the Bristol channel. She also regularly taught Blacksmithing Classes, including as part of a Living History project at Cape Cornwall School in St Just. In September 2014, the Leach Pottery in St Ives commissioned Lisa to restore the original fire place in the pottery, now part of the Museum. This included restoration of the existing ironwork and sensitive installation of a new grate, fire canopy and fire tools. More recently she co founded the Cornish Blacksmiths Collective, to promote the trade in Cornwall. It has provided a valuable network between the Cornish Blacksmiths. In 2014 Lisa was voted Cornish Blacksmithing Champion in recognition of her work. It was during this year she appeared in The Saga Magazine and exhibited for the second time at the prestigious ‘Art in Action’ at Waterperry House near Oxford. In 2015 and 2016 Lisa was invited to appear as a demonstrator at ‘Art in Action’ as a result of which she exhibited in the show’s ‘Best of the Best’ exhibition, where her work was very well received. She was presented with the ”Design and Innovation Award” given by the Guild of Ten at the 2015 Cornwall Design Fair. Lisa is fast forging a name for herself among Cornwall’s leading artists. 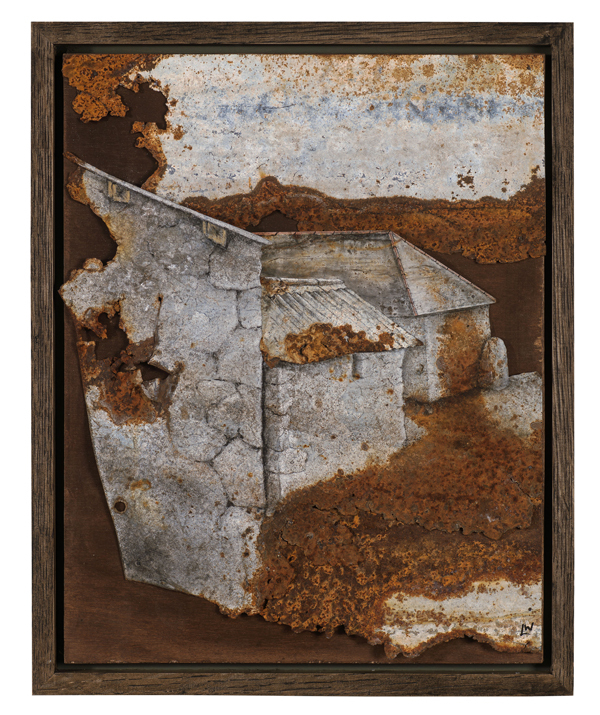 Now in many private collections, Lisa’s work continues to evolve as she refines and develops her techniques.